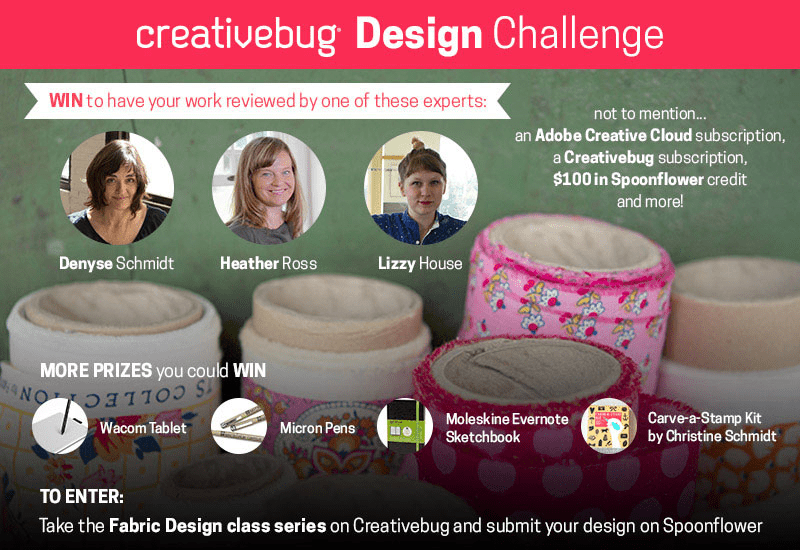 This contest is open to participants enrolled in the Creativebug Fabric Design Series. The top ten designs will be selected by community voting, and the top three popularly-voted designs will receive the winning prize. Anyone can vote (when voting opens on April 16, 2015), but only one set of votes may be submitted per individual. Duplicate votes are filtered using fraud detection software and not counted toward final totals. No Purchase Necessary–Unless membership with Design Challenge partner is required for design submission. 1. Sponsors. Creativebug, LLC, 255 Kansas St., Suite 300, San Francisco, CA 94103 and Spoonflower, Inc. (“Spoonflower”), 2810 Meridian Parkway, Suite 130, Durham, NC, 27113 (Spoonflower and Creativebug, collectively, referred to as “Sponsors”). 2. Eligibility. Promotion is open only to persons who are 13 years of age or older as of March 12, 2015. In order to submit a design to the contest, each participant must also be a registered member of Spoonflower at the time of entry. To become a registered member of the Spoonflower web site, individuals must register for, create an account, and agree to the Spoonflower web site’s Terms of Service, set forth at www.spoonflower.com/terms (“Terms of Service”). Proof of age may be required. There is no fee or charge to become a registered member. Employees, officers, directors and representatives of Creativebug and Spoonflower, as well as immediate family members (spouse and parents, siblings and children and their spouses) and persons living in the same households of each of the above are ineligible to participate. In order to participate you must be able to demonstrate to the satisfaction of the Sponsors that you do not have a current contractual arrangement that would prohibit you from fully participating in this contest and entering into a contract with Creativebug for merchandising and distribution of your designs on textiles. 4/22/15 – Public voting will end. Winner standings will be identified within the top-ten entries, as calculated by total votes. 4/23/15 – Spoonflower will announce the top-ten winning designs. d. Pull down the Action menu over the design you wish to enter in the contest, and select Creativebug Design Challenge under the heading Enter in Contest. 6. Ownership Of Submitted Designs. All design submissions will be subject to the Spoonflower’s Terms of Service (http://www.spoonflower.com/terms) and the additional terms set forth below. Each entrant must be the rightful owner or have authorized use of the e-mail account associated with the e-mail address used to create the Spoonflower account. Limit one (1) person per e-mail address and one Spoonflower account per person. If more than one entry is generated by an individual, additional entries will be disqualified and ineligible for the Promotion. Entries and registration submissions that are inappropriate or in any way out of compliance with these Official Rules will be disqualified. All other entries remain the property of the individual entrants. Design submissions will be accepted only through the Spoonflower web site. Submissions by email, mail, on CD or through any other means will not be included for consideration. Designs submitted for voting must be public, but need not be available for sale. By entering the Promotion, you acknowledge that the design you submit is your own original work, has not been previously published, and does not contain any trademarks, logos, copyrighted material, or any other intellectual property belonging to any third party. You agree to sign any necessary documentation that may be required by Creativebug to certify the use of the rights you granted above. You acknowledge that Sponsors reserve the right to decline to use the design for any reason. You understand that you will not receive any compensation or credit for use of your design, other than what is described in these Official Rules. If the Sponsors determine in their sole discretion that an Entrant has materially breached a representation or warranty at any time during the Competition, then the Entry will be disqualified. 7. Expectations of Entrants. There is no design theme for this contest, but entrants must be enrolled in the Creativebug Fabric Design Series. Should an entrant’s design be selected by voters as one of the winners, he or she will be expected to work with Creativebug in any subsequent promotion of the contest and the Fabric Design Series. As a Participant, you also grant Sponsors the right to use your name, a preview of your design, and any biographical information or photos that you provide to us, in connection with the Promotion, the Fabric Design Series, or your design, in all media (now known or later developed), in any manner, throughout the world, in perpetuity, to promote the Promotion, Spoonflower or Creativebug. 8. Ownership of winning design. Participants in this contest retain ownership of their designs. Any subsequent use of the designs entered into this contest will be negotiated with Creativebug and the contest entrant. Entrants are free to delete designs they have uploaded to Spoonflower at any time. 11. Prize. The top three winning designers will have their work reviewed by Heather Ross, Denyse Schmidt, or Lizzy House and will receive a 12 month subscription to Creativebug (valued at $60), $100 in Spoondollar credit, a 12 month subscription to Adobe Creative Cloud (valued at $600). Folks voted into slots 4-6 will receive a Wacom Tablet (valued at $75), Moleskine Evernote Sketchbook (valued at $25), and a 6-month subscription to Creativebug (valued at $30). The rest of the top ten will take home a Christine Schmidt Carve-A-Stamp Kit (valued at $30), drawing pads (valued at $15), and Micron pens (valued at $8). The winners will be the top ten designs that a) finish in the top ten of all submitted designs as measured by number of votes by the time contest voting closes at 6 pm EST on April 22, 2015, and b) is selected as the winners by authorized representatives from the Sponsors from the top ten designs. All decisions by the Sponsors as to eligibility of voters, votes, or submitted designs are final. All prize elements are subject to the contract signed between the winners and Creativebug. No transfer, assignment, substitution or cash equivalent of any prize element will be permitted. Winners are solely responsible for the reporting and payment of any applicable federal, state and/or local taxes on his/her prize. Winners agree and acknowledge that Sponsors may share his/her name, address and other contact information with one or more third parties in connection with the awarding and/or delivery of the prize, as necessary to deliver and promote the prize.